Abstract: The paper deals with a problem of a passive measurement of the relative position of an optical beacon and an optical camera by a simultaneous analytical method. The beacon is composed of nine light sources which are arranged in space in a defined way. The proposed beacon layout enables the measurement of the beacon range and one position angle of the camera. This paper presents the mathematical model of the measurement method and the results, which were gathered on the basis of two experimental measurements. The first experiment was only indicative. The extreme results of the second experiment were as follows: the minimum and maximum absolute percentage errors of the beacon range were zero and 1.72%, the minimum and maximum errors of the position angle were 0.1 deg and 1.64 deg. The standard commercial cameras and lenses with different focal lengths were used. 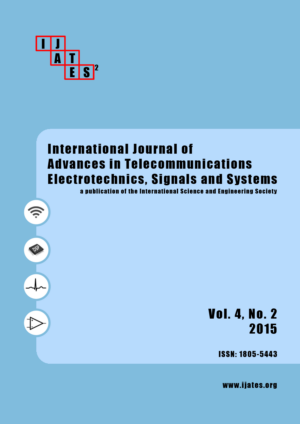 Abstract: The required upgradation of the network capacity of the single-mode fiber which is constrained by the non-linear Shannon’s limit, and the capacity provisioning needed by the future diverse Internet traffic can be resolved by the adoption of the Space Division Multiplexing (SDM) based Elastic Optical Networks (EONs) (SDM-b-EONs). In the current work, we focus on the performance analysis of a SDM-b-EON in which translucent lightpaths are routed through the spectral super-channels over the spatial single-mode fiber(s) bundle(s) links. In regard to regeneration, we investigate three scenarios which differ in their regeneration variability level in addition to the adjustment of modulation formats according to transmission route characteristics. We conduct extensive simulations considering an online traffic case and two realistic network topologies with different numbers of (i) fibers in every link, and (ii) transceivers available within SDM-b-EON. The obtained results demonstrate that when regeneration is conducted with complete flexibility and simultaneously the modulation format conversion is also permitted at every SDM-b-EON node both, largest traffic volume amounts can be provisioned, and significant SDM-b-EON performance scaling can be obtained with a corresponding increase in the utilized fibers amount.